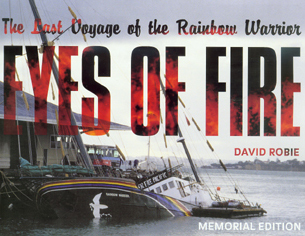 The French sabotage of the Rainbow Warrior hogged the newspaper headlines in July 20 years after the event. But little coverage was given to the actual cause of the bombing - nuclear testing in the South Pacific and the impact on Pacific Islanders. The Rongelapese and Tahitians are still suffering from the legacy of decades of American and French nuclear tests. DAVID ROBIE, the only New Zealand journalist on board the bombed ship, looks behind this sordid act of state terrorism in a New Zealand port. SENATOR Abbaca Anjain-Maddison remembers her uncles stories of nuclear horror when she was growing up as a young girl. John Anjain often told her of the day of the double sunrise. And when her family and the rest of some 320 islanders left Rongelap Atoll on board the Rainbow Warrior just over 20 years ago, they hoped to escape their curse. The curse called Bravo. On March 1, 1954, one sun rose from the east, as usual, while the other loomed from the west. "We heard a noise like thunder. We saw some strange clouds over the horizon. But the sun in the west faded away," Uncle John recalled. He also remembered it as the day it "snowed" on his coral atoll. "In the afternoon something began falling from the sky upon our island. It looked like ash from a fire. It fell on me, it fell on my wife, and it fell on our infant son. It fell on the trees, and on the roofs of our houses. It fell on the reef, and into the lagoon. "We were very curious about this ash falling from the sky. Some people put it in their mouths and tasted it. One man rubbed it into his eye to see if it would cure an old ailment. People walked in it, and children played with it." At the time, John Anjain, who has now died, was mayor of Rongelap in the Ralik ("Sunset") chain in what is now the Republic of the Marshall Islands, but then part of the United States-administered Trust Territory of the Pacific Islands. The second sun John Anjain saw that day was the fireball from an American thermonuclear explosion codenamed Bravo. And the "snow" was radioactive fallout. Since then, the baijin (poison), as the islanders call it, has caused much illness and finally forced them to abandon their ancestral homeland and move to another island in May 1985. When the Americans exploded the H-bomb Bravo on Bikini Atoll, almost 6500 km north-west of New Zealand, it was at the height of the Cold War. The bomb was 15-megatons, more than 1000 times more powerful than the bomb that devastated Hiroshima, and its detonation opened a terrifying new chapter in the arms race. Portuguese-born photojournalist Fernando Pereira, who died on the night of July 10, 1985, when the Greenpeace flagship was bombed by French secret agents at Aucklands Marsden Wharf, had joined the ship for its mission to the Marshall Islands and for the ill-fated voyage to Moruroa atoll to protest over nuclear testing in the Pacific. Pereira joined the Rainbow Warrior in Hawaii and he covered the voyage to Rongelap Atoll, where the islanders wanted to leave their ancestral home. They had serious health problems because of radioactive fallout that had dusted their island from at least five dirty American nuclear tests in the 1950s. Bravo on March 1, 1954, was the worst. Hundreds of people were living on the downwind atolls of Rongelap, Rongerik and Utirik, barely 150 km away to the east. Thyroid tumours, cancers and a host of other illnesses have been the legacy of those tests. The true degree of deadly devastation wrought by these tests between 1946 and 1962 only became known in 1994. The yield of 86 nuclear tests notched up in the Marshall Islands and international waters was equivalent to almost 8600 Hiroshima-size bombs during a 16-year period. 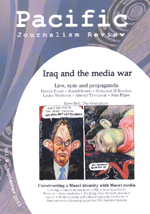 The media cover-up was exposed in a recent book, News Zero: The New York Times and the Bomb, by Beverly Keever, that claimed the most reputable US newspaper had regularly "distorted, omitted or obscured" the deadly impact of the atomic bombs radiation and radioactivity. The "News Zero" strategy about radiation and radioactivity kept in the dark for years the unsuspecting public, out-of-the-loop opinion leaders, at-risk production workers, US servicemen  and Pacific Islanders. Neglected by both the US and Marshall Islands authorities, the Rongelap islanders called on the Greenpeace flagship to evacuate them to Mejato, on Kwajalein Atoll, some 120 km away. Abbaca Anjain-Maddisons father, Senator Jeton Anjain, was the islanders leader at the time and he persuaded Greenpeace to help his people. He wasnt interested in a symbolic mission. "To hell with this symbolic business  we want to move," Anjain told Greenpeace campaigner Steve Sawyer. "I have to move my people and if you can help us, please!" It took four voyages for the Rainbow Warrior to move about 320 Rongelapese, their dismantled homes and belongings  some 100 tonnes  to their new atoll. I was with them on these dramatic trip and captured their plight in pictures and text in my book, Eyes of Fire: The Last Voyage of the Rainbow Warrior. Their future and their health remain uncertain two decades after Greenpeace helped them. But the media spotlight on the humanitarian voyage helped put pressure on the US authorities to make amends. Now, two decades later, the US has provided US$150 million as part of the Compact of Free Association to establish a nuclear claims tribunal to deal with health claims over the testing. It has also given the Rongelap people $60 million to "clean up" the atoll. Although the islanders are debating whether to return to Rongelap, many are not convinced that their atoll is safe yet. Why was the Rainbow Warrior bombed? Many in the French military were blinded by an intense paranoia over Greenpeace and other activists working against nuclear testing in the South Pacific and in promoting independence struggles. Although Greenpeace as an organisation was only concerned with environmental issues, many campaigners believed the issues of a nuclear-free and an independent Pacific were intertwined. One objective could not be achieved without the other. The French secret service  the DGSE  was given a free hand by Defence Minister Charles Hernu to "neutralise" the environmental organisation. The French Prime Minister at the time, Laurent Fabius, recently admitted in a TVNZ interview that he had been "betrayed" by his minister. Hernu died in 1990  still popular over the bombing. The sabotage attack on the Rainbow Warrior certainly wasnt out of character with many other brutal actions taken by French authorities against Greenpeace vessels protesting against nuclear testing in the Pacific. In 1972, for example, French commandos boarded the yacht Vega and savagely beat one of the founders of Greenpeace, David McTaggart. He almost lost an eye. McTaggart filed a civil action against the French Navy, accusing it of piracy, The Paris court found the navy guilty of having deliberately rammed the Vega. In 1995, Greenpeace led another big peace flotilla to Moruroa. French commandos boarded the Rainbow Warrior II, smashed equipment, fired tear gas on the ships bridge, arrested Greenpeace activists and seized the protest ship. France returned the vessel to Greenpeace several months later. And I also had my own personal run-ins with French authorities as a journalist covering environmental and independence issues in the Pacific during the 1980s. In January 1987, a year after the first edition of Eyes of Fire was published and four months before the first of Sitiveni Rabukas two military coups in Fiji, I was arrested at gunpoint by French troops near the New Caledonian village of Canala. The arrest followed a week of being tailed by secret agents in Noumea. When I was handed over by the military to local gendarmes for interrogation, accusations of my being a "spy" and questions over my book on the Rainbow Warrior bombing were made in the same breath. But I was released after about four hours of questioning. At the time it seemed unlikely that in less than two decades nuclear testing would be finally abandoned by France in the South Pacific. After being awarded $8 million in compensation  but no apology  from France by the International Arbitration Tribunal, Greenpeace finally towed the Rainbow Warrior to Matauri Bay and scuttled her off Motutapere, in the Cavalli Islands, on December 12, 1987, to create a living reef. An earlier compensation deal for New Zealand mediated in 1986 by United Nations Secretary-General Javier Perez de Cuellar awarded the Government $13 million  the money was used for a Peace and Disarmament Education Trust fund and the Pacific Development and Conservation Trust. The agreement included an apology by France and the deportation of jailed secret agents Alain Mafart and Dominique Prieur after they had served less than a year of their 10-year sentences for manslaughter and wilful damage of the bombed ship. Dr Bengt Danielsson, a Swedish anthropologist, and his French wife, Marie-Thérèse, were an inspiration to the nuclear-free and independent Pacific movement, especially in the Cook Islands, New Zealand and Tahiti. Along with Elaine Shaw of Greenpeace Aotearoa, they played a vital role in raising public awareness of the plight of Tahitians harmed by the years of French atmospheric nuclear tests. While the Danielssons published several scientific studies and popular books on the islands, they constantly campaigned to expose French nuclear colonialism  particularly through their books Moruroa, Mon Amour and Poisoned Reign. The couple were honoured for their commitment and achievements with the Right Livelihood Award, an alternative Nobel Peace Prize-style international recognition. However, Danielssons health deteriorated after this honour and he died in July 1997, barely a year after French nuclear testing in the Gambiers had ended for good. France had agreed to sign the Comprehensive Test Ban Treaty after a final swansong package of eight planned nuclear tests to provide data for simulation computer software. But such was the strength of international hostility and protests and riots in Papeete that Paris ended the programme prematurely after just six tests. France officially ratified the CTBT on September 10, 1996. Pacific nuclear-free campaigners were heartened last year when Tahitians elected Oscar Temaru as their territorial president. He had established the first nuclear-free municipality in the Pacific Islands when he was mayor of the Papeete airport suburb of Faaa. Since the Temaru coalition came to power, demands have increased for a full commission of inquiry to investigate new evidence of radiation exposure in the atmospheric nuclear tests in the Gambiers between 1966 and 1974. Altogether France detonated 193 of a total of 210 nuclear tests in the South Pacific, 46 of them dumping more than nine megatons of explosive energy in the atmosphere  42 over Moruroa and four over Fangataufa atolls. The pressure on France will continue. The sordid Rainbow Warrior affair was a diplomatic debacle for the French, especially in the South Pacific, and it has taken years for Paris to recover some mana in the region. Greenpeace and the environmental movement have grown dramatically and matured over the past two decades. Campaigns have been broadened into issues such as climate change, driftnet fisheries, genetic engineering, glacier retreat and the illegal rainforest timber trade. The Tahitians may now win some compensation from France for being poisoned just like the Rongelapese. Moruroa was their curse, just like Bravo.